This true and dramatic story begins with the finding of the last expedition diary of a forgotten Edinburgh cartographer - Keith Johnston. The diary was lying in the Royal Geographical Society of Scotland's storeroom and concerns his last, fatal expedition into the interior of Africa. Johnston's family background in 19th-century Edinburgh is described as is the profound influence of his father, one of the great figures in the development of geography and cartography. As curator of maps to the Royal Geographical Society, Keith Johnston became embroiled in the great controversies of the time surrounding Livingstone's claims to finding the source of the Nile. Frustrated with his deskbound job, he conducted a survey of the Paraguayan-Brazil border, where his adventures were to establish his reputation as a competent explorer and ultimately led to his leadership of the Royal Geographical Society's expedition to find a feasible trade route to the central lakes of Africa. The influence of David Livingstone and his tense encounters with H.M. Stanley provide a background to the final fraught relationship with his colleague, Joseph Thomson, during their prolonged stay in Zanzibar. Shortly after the expedition into the interior began, Johnston contracted dysentery and tragically died in the village of Behobeho at the early age of 34. 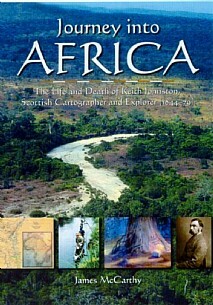 Searching for Keith Johnston; Auld Reekie - Edinburgh in the 19th century; Alexander Keith Johnston - "A painstaking and untiring diligence"; Johnston Secundus - the making of a cartographer; a Paraguayan adventure - the first exploration; "Only waiting the hand of civilized man"; African travel - "a chaos world"; Zanzibar - expedition capital; journey into Africa - the road to Behobeho; post mortem - the problem with Joseph Thomson.